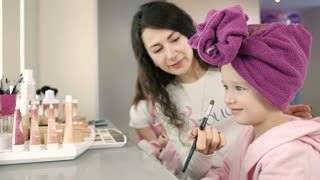 Make up artist doing make up with big brush to pretty little girl in salon. Close up view of pretty little girl with curls. Nail artist doing manicure for little girl in professional salon.